В настоящей работе показано наличие биологической активности гомеопатических препаратов, их отличие от плацебо, проведен анализ наиболее крупных клинических исследований по гомеопатическим препаратам. Томкевич М.С. Клинические исследования в гомеопатии // Традиционная медицина, 2011,3:14-25.
International Congress for Integrative Health and Medicine, proceedings, Stuttgart, 2016.
ne // Med. Res. Methodology, 2004, 4:4. Trevor D.B. Thompson, Weiss M. Homeopathy – what are the active ingredients. An exploratory study using the Medical Research Council’s Framework for the evaluation of complex interventions // Complement. Altern. Med. – 2006, 6:37. Томкевич М.С. Экспериментальные исследования в гомеопатии // Традиционная медицина. –2011, 2:8-18. Kirkby R., Herscu P. Homeopathic trial design in influenza treatment // Homeopathy. – 2010, 99:69–75. Nuhn T., Luedtke R., Geraedts M. Placebo effect sizes in homeopathic compared to conventional drugs – a systematic review of randomised controlled trials // Homeopathy. – 2010, 99:76–82. Milgrom L.R. Journeys in the Country of the Blind Entanglement Theory and the Effects of Blinding on Trials of Homeopathy and Homeopathic Provings. Evd Based // Complem. Altern. Med. – 2007, 4, 1:7–16. Fisher P., McCarney R., Hasford Ch., Vickers A. Evaluation of specific and non-specific effects in homeopathy; feasibility study for a randomised trial // Homeopathy. – 2006, 95:215–222. Wallach H. The Efficacy Paradox in Randomised Controlled Trials of CAM and Elsewhere: Beware of the Placebo Trap // The Journal of Alternative and Comple-mentary Medicine. – 2001;7:213–218. Bell I.R. Evidence-Based Homeopathy. Empirical Questions and Methodological Considerations for Homeopathic Clinical Research // American Journal of Homeopathy. – 2003, 96:17–31. Fisher P., Greenwood A., Huskisson E.C. Effect of homeopathic treatment on fibrositis (primary fibromyalgia) // British Medical J. – 1989, 299:365–366. Bell I.R., Lewis D.A., Brooks A.J., Schwartz S.E., Lewis B.T. Walsh C.M. et al. Improved clinical status in fibromyalgia patients treated with individualized homeopathic remedies versus placebo // Rheumatology. – 2004, 43, 5:577–582. Taylor M., Reilly D., Llewellyn-Jones R. Randomised controlled trial of homoeopathy versus placebo in perennial allergic rhinitis with overview of four trial series // British Medical J. – 2000; 321:471–476. Reilly D., Taylor M.A., Beattie N.G., Campbell J.H., McSharry C., Aitchison T.C., Carter R. et al. Is evidence for homoeopathy reproducible? // Lancet. – 1994, 344, 8937:1601–1606. Chand K.S., Manchanda R.K., Mittal R., Batra S., Banavaliker J.N., De I. Homeopathic treatment in addition to standart care in multidrug resistant pulmonary tuberculosis: a randomized double-blind placebo controlled clinical trial // Homeopathy. – 2014, 103: 97–107. Berrebi A., Parant O., Ferval F., Thene M., Ayoubi J.M., Connan L. et al. Traitement de la douleur de la monteelaiteuse non souhaitee par homeopathiedans le post-partum immediate // J. Gynecol.Obstet. Biol. Reprod. – 2001, 30:353–357. Chakraborty D., Sengupta J. Homeopathic medicine – an effective tool for eradication of leprosy. In: 25-th Congress of Asian Homeopathic Medical League proceedings. – М., 2016. – 222–224. Berrebi A., Parant O., Thene M., Ayoubi JM, Connan L, BelonP. Traitement de la douleur de la monteelaiteuse non souhaitee par l’homeopathiedans le post-partum immediate // J. Gynecol. Obstet. Biol. Reprod. – 2001, 30:353–357. Colau J.C., Vincent S., Marijnen P., Allaert F.A. Efficacy of a non-hormonal treatment, BRN-01, on menopausal hot flashes. A multicenter, randomized double blind, placebo-controlled trial // Drugs in Research and Development. – 2012,12(3):107–119. Ulbricht C., Chao W., Clark A., Conquer J.A., Cook D., Costa D. et al. Oscillococcinum (Anas barbariae hepatis et cordis extractum 200K HPUS). An Evidence-Based Systematic Review by the Natural Standard Research Collaboration // Alternativе and Complementary therapies. – 2011, 17 (1):41–49. Ferley J.P., Zmirou D., D’Adhemar D., Balducci F. A controlled evaluation of a homoeopathic preparation in the treatment of influenza-like syndromes // Br. J. clin. Pharmac. – (1989), 27:329–335. Papp R., Schuback G., Beck E., Burkard G, Bengel J., Lehrl S. et al. OscillococcinumR in patients with influenza-like syndromes: A placebo-controlled double-blind evaluation // British Homoeopathic J. – l998, 87:69–76. Casanova P., Gerard R. Bilan de 3 annees d’etude a randomisees multicentriques Oscillococinum/placebo. Proposta Omeopatica, 1988, 6:14-17. Селькова Е.П., Калюжин О.В. ОРВИ и грипп. – М.: ООО «Издательство «Медицинское информационное агентство», 2015. – 224 с.
Marrari L.A., Terzan L., Chaufferin G. Oscillo-cocinum for influenza treatment. Ann. 1st Super Sanita, 2012, 48 (1):105–109. Multidisciplinary Respiratory Medicine. – 2016, 11:12. Jacobs J., Jonas W.B., Jimenez-Perez M., Crothers D. Homeopathy for childhood diarrhea: combined results and meta-analysis from three randomized, controlled clinical trials // Pediatric Infectious Disease Journal. – 2003; 22: 229–234. Mathie R.T., Lloyd S.M., Legg L.A., Clausen J., Moss S., Davidson J.R. et al. Randomised placebo-controlled trials of individualised homeopathic treatment: systematic review and meta-analysis // Systematic Reviews. – 2014; 3: 142. Жданова В.Ю. Сравнительная оценка гомеопатического и аллопатического вариантов лечения цирковых животных // В: Материалах 1-го Евразийского конгресса по гомеопатической медицине. – М., 2016. – С.105–107. Medical Research, Brussels, Belgium (1996). Cucherat M., Haugh M.C., Gooch M., Boissel J.-P. Evidence of clinical efficacy of homeopathy – A meta-analysis of clinical trials // European Journal of Clinical Pharmacology. – 2000. – 56: 27–33. Witt C.M., Luedtke R., Baur R., Willich S.N. Homeopathic Medical practice: long-term results of a cohort study with 3981 patients // Public Health. – 2005, 5: 115. Luedtke R., Hacke D. On the effectiveness of the homeopathic remedy Arnica Montana // Wiener MedizinischeWochenschrift. – 2005, 155:482–490. Rutten L. The benefits of Arnica // Homoeopathy. – 2004, 93 (1):63–66. Rossignol M., Begaud B., Engel P., Avouac B., Lert F., Rouillon F. Impact of physician preferences for homeopathic or conventional medicines on patients with musculoskeletal disorders: results from the EPI3-MSD cohort // Pharmacoepidemiol Drug Saf. – 2012; 21(10):1093–101. Grimaldi-Bensouda L., Bégaud B., Lett F., Rouillon F., Masso J.l., Guillemot D. et al. Benchmarking the burden of 100 diseases; results of a nationwide representative survey within general practices. BMJ Open 2011; 1(2):e000215,doi10.1136/bmjopen-2011-0002;1-11. Rossignol M., Begaud B., Avouac B.,Lert F., Rouillon F., Bénichou J.et al. Benchmarking clinical management of spinal and non-spinal disorders using quality of life: results from the EPI3-LA-SER survey in primary care // European Spine J. – 2011, 20(12): 2210–6. Lert F., Grimaldi-Bensouda L., Rouillon F., Massol J., Guillemot D., Avouac B.P. et al. Characteristics of patients consulting their regular primary care physician according to their prescribing preferences for homeopathy and complementary medicine // Homeopathy. – 2014, 103(1), 51–57. Grimaldi-Bensouda L., Bégaud B., Rossignol M., Avouac B., Lert F. Management of upper respiratory tract infections by different medical practices, including homeopathy, and consumption of antibiotics in primary care: the EPI3 cohort study in France 2007-2008. PLoSOne. 2014 19; e89990. Trichard M., Chaufferin G., Nicoloyannis N. Pharmacoeconomic comparison between homeopathic and antibiotic treatment strategies in recurrent acute rhinopharyngitis in children // Homeopathy. – 2005, 94:3–9. Witt C., Keil T., Selim D. Outcome and costs of homoeopathic and conventional treatment strategies: Acomparative cohort study in patients with chronic disorders // Complementary Therapies in Medicine. – 2005, 13:79–86. Witt C.M., Lüdtke R., Mengler N., Willich SN.How healthy are chronically ill patients after eight years of homeopathic treatment? Results from a long term observational study // BMC Public Health. – 2008, 8:413. Riley D., Fischer M., Singh B., Haidvogl M., Heger M. Homeopathy and Conventional Medicine: An Outcomes Study Comparing Effectiveness in a Primary Care Setting // Journal of Alternative and Complementary Medicine. – 2001, 7:149–159. Haidvogl M., Riley D.S., Heger M., Brien S., Jong M., Fischer M. et al. Homeopathic and conventional treatment for acute respiratory and ear complaints: A comparative study on outcome in the primary care setting BMC Complement Altern Med. 2007; 7: 7. Bornhöft G., Matthiessen P.F. (eds). Homeopathy in healthcare – effectiveness, appropriateness, safety, costs. – Berlin: Springer, 2011. – 230 p.
Colas A., Danno K., Tabar C., Duru G. Economic Impact of homeopathic practice in general medicine in France // Health Economic Review. – 2015, 5(1): 55. Merrel W.C., Shalts E. Homeopathy // Med. Clin. North Amer. – 2002, Jan, 86 (1): 47–62. Kienle G.S., Kiene H., Albonico H-U. Antroposophic Medicine. – Schattauer GmbH, 2006. – 349 p.
Koes B.W., Scholten J.P.M., Mens J.M., Bouter L.M. Efficacy of epidural steroid injections for low-back pain and sciatica: a systematic review of randomised clinical trial // Pain. – 1995, 63:279–288. Freireich E.J. The randomised clinical trial is not the best and certainly not the only way to conduct clinical research. Advances // The Journal of Mind-Body Health. – 1997, 13: 41–44. Международные нормативные и аналитические материалы по гомеопатии. Сборник материалов. Часть1. // М., 2017, 223 с.
М. С. Томкевич, «К ВОПРОСУ ОБ ЭФФЕКТИВНОСТИ ГОМЕОПАТИИ», Научно-практический журнал, вып. 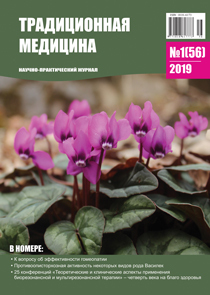 1(56) 2019, сс. 4-12, апр. 2019.